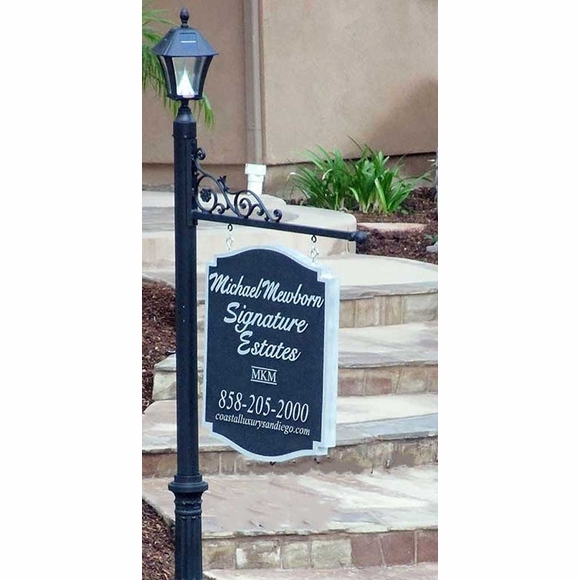 Custom Real Estate Signage System with Solar Lamp - - ready to hold your hanging Property For Sale or House For Sale sign. Sign not included. 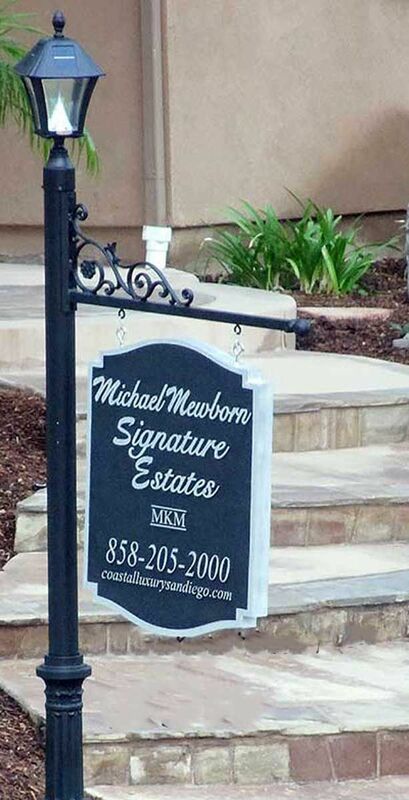 Post features a durable, low-maintenance powder-coat finish in black or white. Solar powered, no wiring needed. Efficient Li-Ion rechargeable batteries included. Light output: approx. 80 lumens. Post is a total of 72" for the in ground mount. Goes into ground at least a foot and a half, meaning it will stick up out of the ground approx. 4.5' not including the solar lamp attached to top. For ground spike, the post will be approximately 16" shorter in length. For both mount types, height above ground will be approx. 4.5' not including the solar lamp. Please pick correct mount type when ordering because changing mount types requires entire post replacement. Also available with a decorative finial instead of the solar lamp. Step 1) Pound ground spike into desired location by hammering on block of wood. Step 2) Slide the base up on the bottom of the pole. The base will need to be slid up high enough to insert 4" pass through bolt through the ground spike bracket and through the pole. Use masking tape or equal to prevent scratching the pole when sliding the base up past its permanent installed height. Step 3) fasten bolt and slide base down and secure 3 set screws on the base. For in ground burial instructions, please enlarge last small image on right above.